The restaurant will offer four styles of dining and will have an outdoor area. Sodexo, the company behind the Perch in the Arts Building, will run the new 300-seat restaurant in the Business School, featuring an outdoor area and space for a pop-up restaurant. Sodexo, one of the world’s largest multinational companies, won a public tender for the catering provider in the building. Speaking to The University Times, the Dean of the Business School, Andrew Burke, said that the company has “done a really nice design” and that “they do catering for many universities around Europe and they’re quite diverse in what they’re doing”. The design that Sodexo presented ultimately won the company the restaurant, with Burke describing it as “very contemporary – dare I say cool – setup and imagery”. “What we need to replicate here is the type of restaurants that are available around the university but not in it”, Burke said. The restaurant will be broken up into four areas, with “nice areas to sit and work”, according to Burke. One area of the restaurant, which is located on the ground floor of the building, has an outdoor area, while another will host a series of pop-up vendors. The outdoor area will be near the College-facing entrance of the building. Sodexo will also run a cafe in the basement of the building. The building is set to open on time for the Global Business Forum in March. Burke has taken several tours of the building at the various stages of construction. “The scale of it blew me away”, he said. 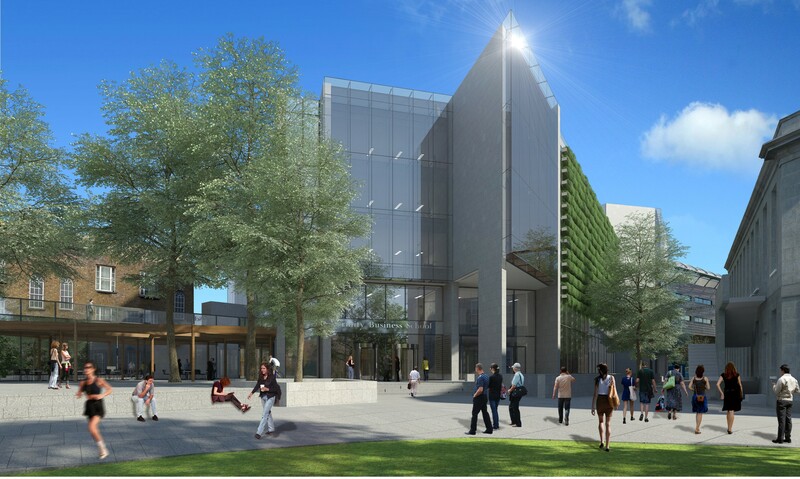 The building will house Business School offices and classrooms, with three main lecture theatres. The big space in the basement will hold up to 600 people, with the possibility of it being broken into two spaces. The space will be able to host concerts, exhibitions and conferences. A recent email from the College’s Chief Operating Officer (COO) Geraldine Ruane appealed to students to name the restaurant. In her email, Ruane said it was “an exciting time” for the Business School, and that the restaurant would “provide nutritious, delicious and energising food for both students and staff”. The deadline for name suggestions was in late October and €50 top-up will be presented to the winner.